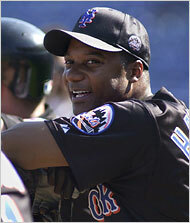 Darryl Quinn Hamilton was born on December 3, 1964 in Baton Rouge, Louisiana. The six foot, left handed hitting, right handed throwing Hamilton was signed out of Nicholls State University, by the Milwaukee Brewers in 1986. Hamilton was known as an exceptional defensive outfielder with speed & a strong throwing arm. He began in the Rookie League and almost hit .400 getting promoted to A ball where he hit .328 at Stockton in 1987. In 1988 he then hit .325 at AAA Denver in 1988. He made brief appearances with the Brewers over the next two years & by 1991 he was a Brewers everyday player. This was at the Brewers post Paul Molitor era & the point where Robin Yount was winding down his career. In 1991, his first full season, Hamilton would bat .311 with 57 RBIs & 16 stolen bases, making a big impact in the Brewer line up. In 1992 he stole 41 bases (9th in the AL) with seven triples (7th in the AL) batting .298 with 5 HRs & a career high 62 RBIs. He was a god contact hitter, batting over .290 six times in his career, with four .300 plus seasons. In the outfield he led the league in fielding percentage four different times, as well as put outs once. 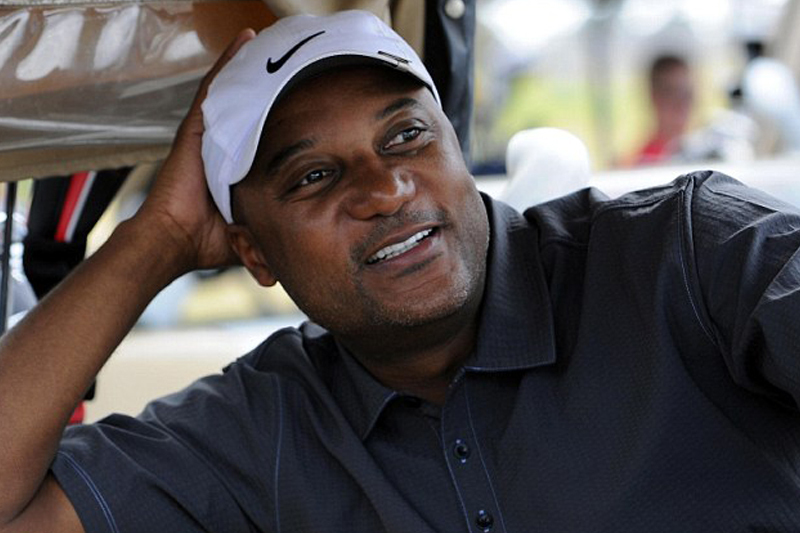 After spending seven years in Milwaukee (1988-1995) he signed a one year deal with the Texas Rangers in 1996. That year he hit.293 with 29 doubles 15 stolen bases 6 HRs & 51 RBIs getting to his first post season. 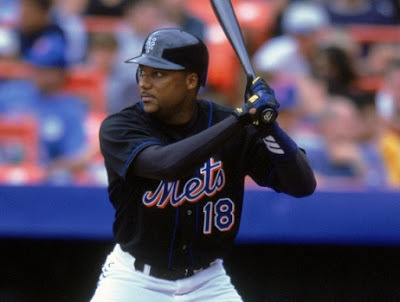 He moved on to the San Francisco Giants (1997-1998) where he played two games in the 1997 NLDS loss to the Florida Marlins. 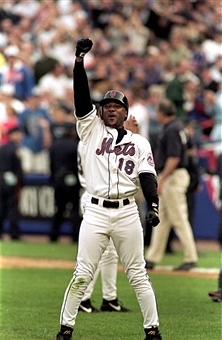 Trivia: On June 12, 1997 got the first official hit in regular season inter-league game history. Hamilton singled off the Texas Rangers Darrin Oliver to lead off the game at Candlestick Park in San Francisco. 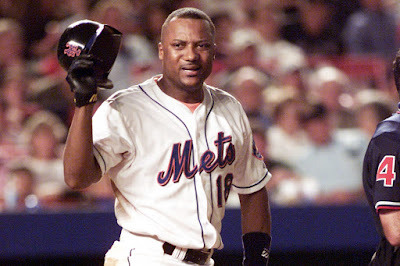 In August of 1999 he was traded to the New York Mets for outfielder Brian McRae. 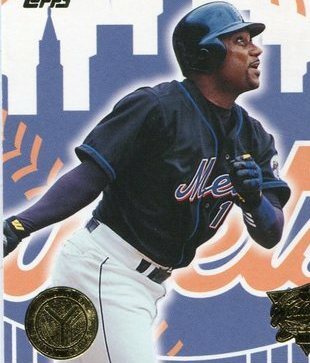 In his first game with the Mets on August 1st, 1999 he played center field & had a pair of hits with an RBI at Wrigley Field in Chicago. 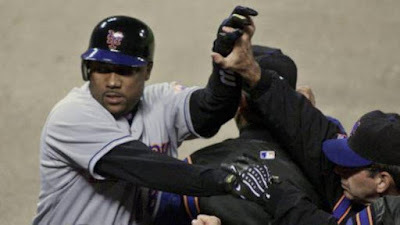 The next day he got two more hits going 2-4 in Milwaukee in a Mets 7-2 win over the Brewers. His hitting couldn’t be ignored as he found himself in Bobby Valentine's lineup more often than not. On August 30th he had a huge four hit day with a HR & three RBIs in the Mets 17-1 win at Houston against the Astros. 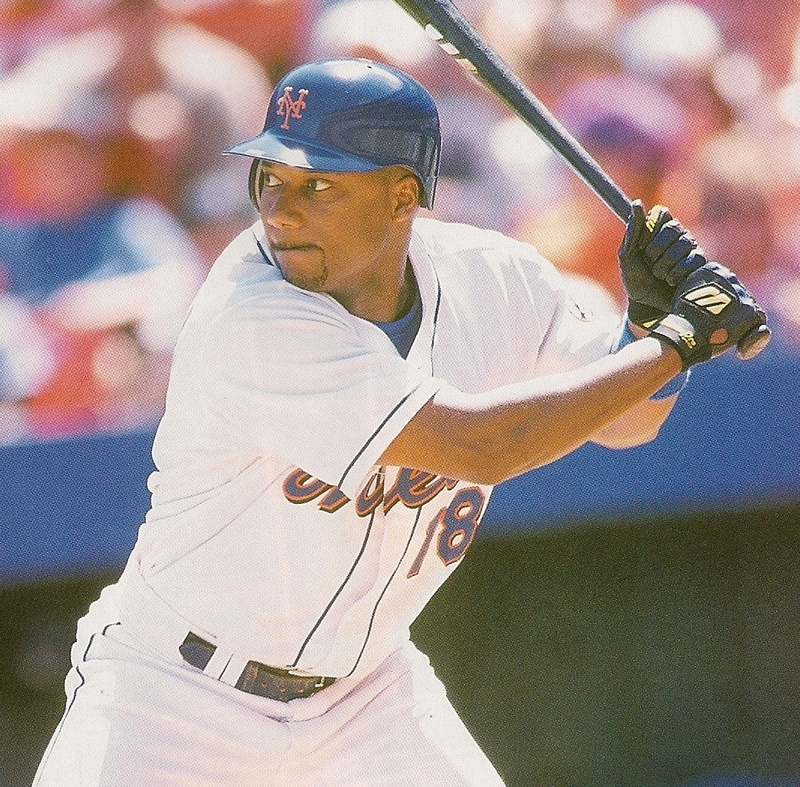 On September 5th Hamilton hit a grand slam HR at Shea Stadium in six run 5th inning as the Mets went on to a 6-2 victory. 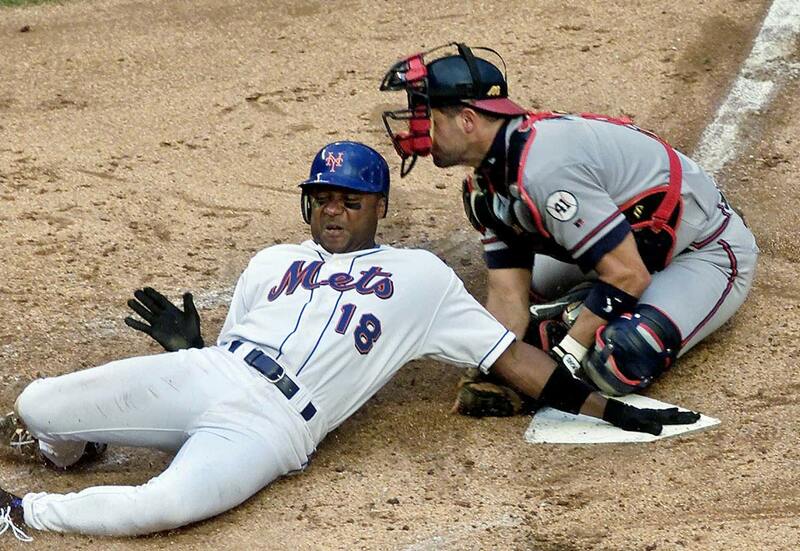 He hit safely in 20 of his first 27 games as New York Met, and would lead all NL centerfielders in fielding % (.1000). He made no errors in 102 chances with two assists in centerfield. In only two months in New York he batted .339 with a .419 on base %, 5 HRs 19 walks 19 runs scored & 21 RBIs. 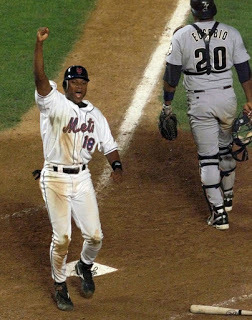 On October 2nd, he doubled in the fourth inning off the Pirates Kris Benson tying the game the Mets went on to win in the bottom of the 9th inning. The win tied them with the Cincinnati Reds to force a one game playoff for the Wild Card title. In that game Hamilton went 1-4 with a walk. 1999 Post Season: Hamilton got into four games of the NLDS against the Arizona Diamondbacks. In Game #3 of the NLDS, he came in as a pinch hitter in the 5th inning & remained in the game. In his second at bat drove in John Olerud & Roger Cedeno with a base hit off Arizona’s Dan Pleasac, topping off a six run 6th inning, in the Mets 9-2 victory. It was the only hit he had in the series going 1-8 (.125). He was on deck in Game #4 when Todd Pratt hit his game winning walk off HR. 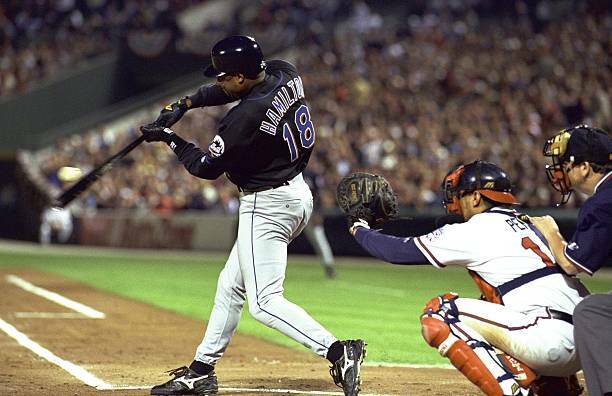 1999 NLCS: He had a much better NLCS, batting .353 getting six hits in 17 at bats against the Atlanta Braves. He played in five of the six games. Hamilton got two hits in the 15 inning Game #5 win, where Robin Ventura hit the famous grand slam single. He got the start, but was removed in the 9th inning as Benny Agbayani came in to pinch hit for him. Hamilton then had a big three hit night in Game #6 at Atlanta, driving in two runs. In the 5th inning with the Mets down 5-1, he singled off Kevin Millwood driving in John Olerud & Robin Ventura, bringing the Mets within two runs of the Braves. Although they would tie the game up, they lost in the 11th inning & their season ended in an NLCS loss. On Opening Day 2000 in a game played at the Tokyo Dome in Japan, Hamilton was the Mets starting centerfielder. He drove in a run with a 3rd inning sac fly against the Chicago Cubs. On April 7th he sprained his foot & was out until early August. 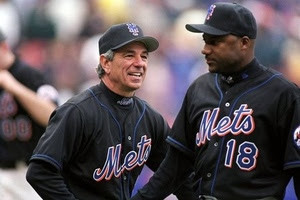 By that time Jay Payton had taken over centerfield & the Mets were one of the best teams in NL. 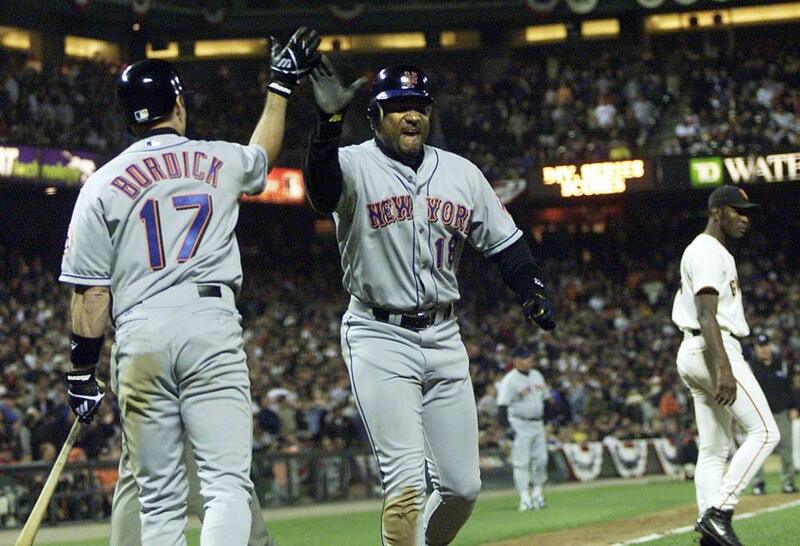 He returned on August 9th, and hit a two run pinch hit HR INa 12-5 Mets win over the Astros in Houston. Although he had began the month with a .188 average, he brought it up to .224 by August 31st. He would also draw 11 walks in 17 games that month, putting up solid on bas percentages. In September he hit well enough to raise his average fifty points. As a pinch hitter he was 3-6 in pinch hit appearances. On September 27th his base hit off the Braves Kevin Millwood, broke a 1-1 tie in the 5th inning. The Mets went on to a 6-2 win. For the Mets 2000 NL Championship season he hit .276 with 29 hits 1 HR 6 RBIs & 14 walks posting a .358 on base % playing in 43 games. 2000 Post Season: In the 2000 NLDS against the San Francisco Giants, Hamilton went 2-3 as a pinch hitter, batting .500 overall (2-4). In Game #2 at Pac Bell Park, Hamilton had a huge pinch hit base hit in the top of the 10th inning. With the game tied at 4-4 he doubled off Giants pitcher; Felix Rodriguez. Jay Payton followed with a base hit, scoring Hamilton with what was the games winning run. He would have seven more pinch hit appearances through the post season, going a hitless 0-5. In 2001 the 36 year old Hamilton lost more time to injuries, and would only bat. 214 in 52 games, retiring at the end of the season. He finished his 13 year career with a .291 batting average, 1333 hits 163 stolen bases, 204 doubles, 51 HRs 454 RBIs & a .360 on base percentage. His .995 fielding % ranks him as one of the best all time in the outfield. Retirement: After his playing days he worked for MLB radio as a color analyst. In 2006 he went to work for Major League Baseball Commissioner's Office of On-Field Operations, reporting to Vice President Bob Watson. In 2012 he began working a number of games as an analyst for the Los Angles Angels of Anaheim. 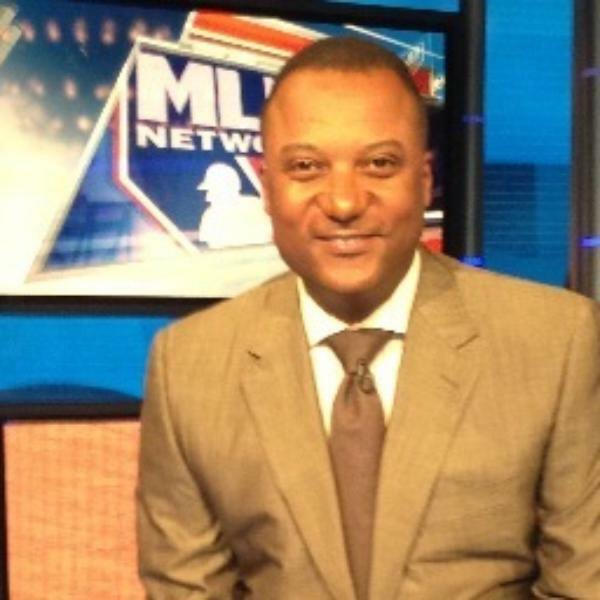 In 2013 he joined the MLB network as an analyst. In 2014 Hamilton joined Jerry Augustine & Joe Block calling games for the Milwaukee Brewers, when Bob Ueker is absent. Family: Hamilton met model Ursaline Steinke during Spring Training while in Scottsdale Arizona. They fell in love & she eventually gave up her career in modeling in Milan & moved with him to San Francisco. There she blossomed once again as a model & made a good career for herself as well. The two married & have two sons together, but eventually divorced. Passing: On June 21st, 2015 Darryl Hamilton was found dead after being shot multiple times at his home outside of Houston. 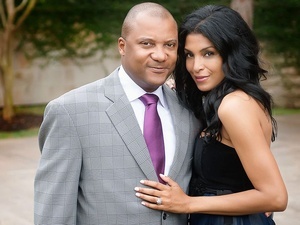 Hamilton was killed by his girl friend Monica Jordan, 44, who was found in another part of the house, dead with a self inflicted gun shot. The event happened in the expensive suburb outside of Houston at Pearland, Texas. The Houston Chronicle reported that Police originally were responding to a domestic dispute, but upon arrival found Hamilton dead just inside the front door. The couple lived together with her two children & their nine month old baby. Hamilton has two sons from his prior marriage to model Ursaline Steinke. On the day he was killed, he wished everyone a Happy Fathers Day on his social media site, with a picture of his two sons. He was a very valuable all around player & pinch hitter. He was a good guy & a very popular player with his teammates & fans alike. He was just 50 years old. A moment of silence was held at Citi Field before the Mets, Reds game the following Friday night, after the Mets returned from their road trip.